Information has value! However, it is difficult to measure the value of information which is provided through the EPCglobal architecture. How do you calculate the value of supply chain visibility for example? Surely there are numerous calculations, but these are mostly based on “educated guessing”. Additionally the value of information is spread across multiple stakeholders, but costs and benefits are not evenly distributed. Mandating has failed in most industries as a means to push information suppliers into using RFID and the EPCglobal architecture. Alternative Cost Benefit Sharing approaches are limited in their scalability and fail to quantify the real value of RFID and the EPCglobal architecture, as there are many intangible benefits that are difficult to measure. In a prototypic installation Fosstrak and jBilling have been used to connect information queries and information prices, thus providing a technical infrastructure to evaluate and bill product-related information. jBilling is an open source billing solution that is used, for example, in telecommunication industries. And this is what it looks like. 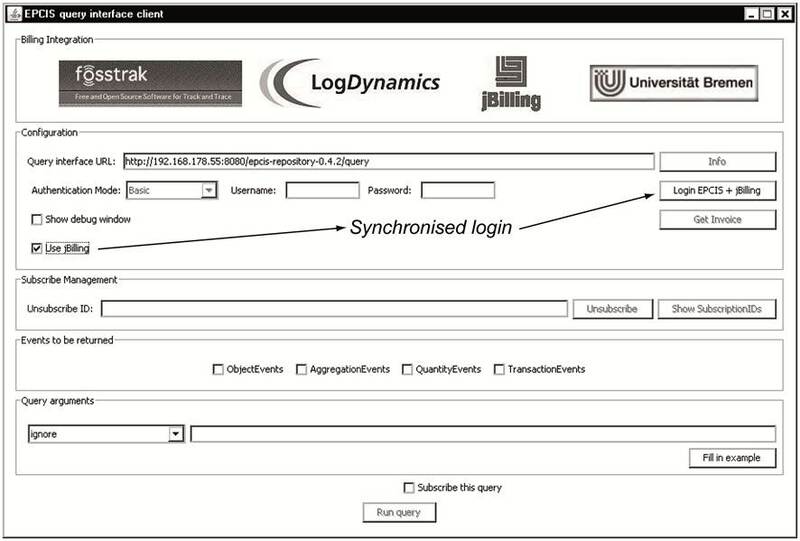 First a combined login procedure for Fosstrak and jBilling has been developed. 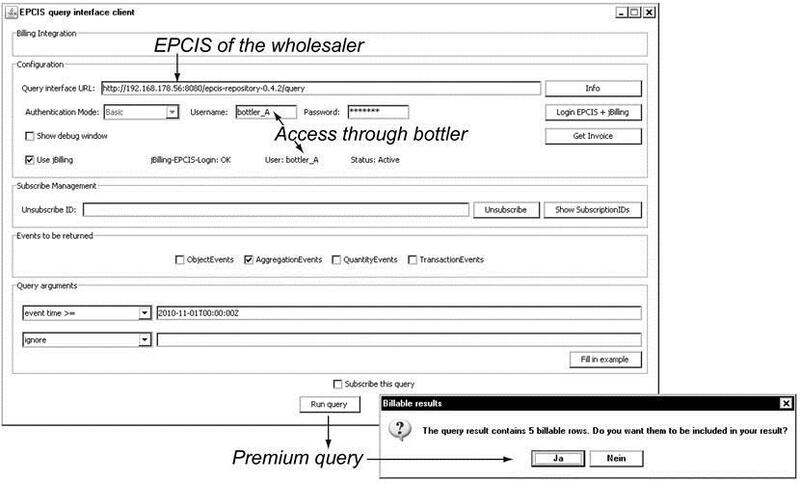 The model of a billing-enabled EPCglobal Architecture has been verified through a lab-based scenario for the beverage industry. 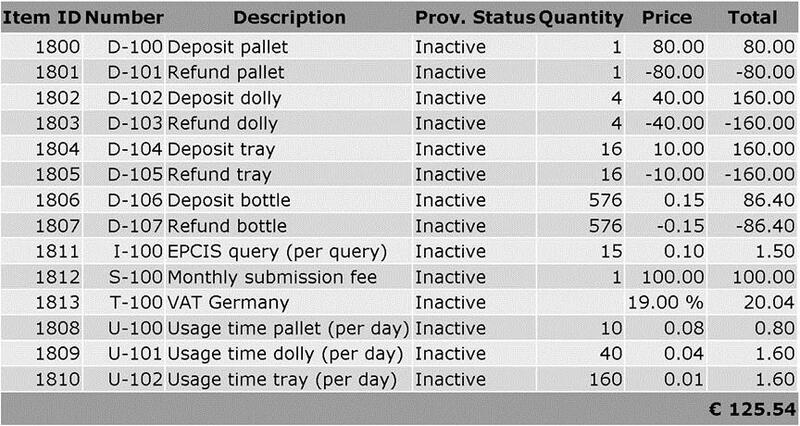 If for example the wholesaler queries the EPCIS of the bottler, some of the retrived information (e.g. sales data) has to be paid for as shown in the figure above. These values can be charged individually or they can be combined with other payments such as deposits in the beverage scenario. If the willingness to pay for information increases, the suggested solution provides improved measurability, quantification and optimisation of information value, thus enabling new business models based on product- and supply network-related information sales in the EPCglobal architecture. In the long run this would allow an (r-) evolutionary process change from an “information exchange model” to an “information trade model”. As mentioned this solution has only been used in a prototypic scenario as part of a dissertation thesis, so there is no source code available for the connection between Fosstrak and jBilling. If your interested in further information, please contact Dieter Uckelmann at HFT Stuttgart. We are very happen to announce that the Fosstrak open source EPCIS repository has just been downloaded for the 2000th time since the initial release in 2007. This makes the Fosstrak EPCIS repository probably the most widely deployed implementation of the EPCglobal EPCIS standard. We’ve come along way from the initial alpha release back in 2007 to today’s EPCglobal certified version that is seeing significant use by a broad spectrum of users – both in academia and in industry. You are currently browsing the archives for the EPCIS category.